This oceanfront paradise is just moments away from downtown San Miguel and Chakanaab Park. Cap off a thrilling day of diving the Caribbean reefs, exploring ancient Mayan ruins or strolling the quaint streets of San Miguel by coming back to the refreshing elegance of your spacious room. All suites and rooms include a kitchenette with a mini fridge, satellite TV and a private balcony. Indulge in international cuisine or have a drink at the bar and enjoy spectacular views of the ocean and pool. 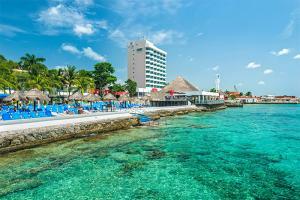 Located on the northwestern part of Cozumel, just steps away from the ocean.